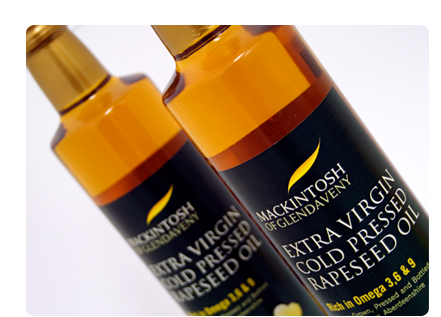 At Mackintosh of Glendaveny, we set our hearts in producing the great local Scottish alternative to olive oil from rapeseed grown on our farm.  Our Extra Virgin “cold pressed” rapeseed oil is grown, pressed and bottled on our farm in Glendaveny, Aberdeenshire. It really is the new essential in your kitchen with great cooking qualities and health benefits. It has a wide range of uses and ideal for dressings, marinades, baking, roasting and stir-frying. With only 6% saturated fat (lowest levels of any other oil on the market) and rich omega 3,6 and 9 contents it is a healthier local alternative to the foreign Olive oil. In fact, our Extra Virgin “cold pressed” rapeseed oil has half the saturated fat content and 10 times more Omega 3 levels than Olive oil. All the natural goodness, golden colour and great taste are retained in our oil as we add nothing to it and take nothing away. It is just simply 100% pure healthy home grown oil, pressed and bottled on our family farm. Rapeseed oil is readily available in supermarkets and wholesale outlets, although this is mass produced, hot pressed, chemically extracted oil which has even been deodorised taking away any form of the great taste, colour and smell leaving a cooking material with very little goodness. “Cold pressed” is the Key! We cold press our rapeseed gently extracting the oil, retaining all of the natural goodness from seed to bottle. 100% Free from preservatives and chemicals!